Bremen (Germany) from Monday to Tuesday, March 21st to 22nd, 2011. The ‘Mobile learning: Crossing boundaries in convergent environments’ Conference, taking place in Bremen (Germany) from Monday to Tuesday, March 21st to 22nd, 2011, builds on a series of mobile learning research symposia hosted by the WLE Centre for Excellence at the Institute of Education, University of London between 2007 and 2009. 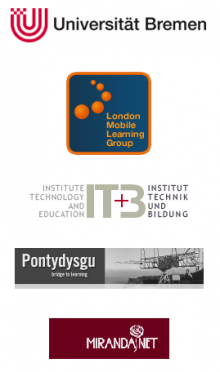 It will focus on the challenges of developing new pedagogic approaches and on the potential of mobile devices for learning in formal and informal contexts. As mobile learning is not only about learning with mobile technologies, but also considered to be “new” learning, the conference will look at challenges for research and practice in understanding the changing social and technological structures allowing the use of technology for learning that are present in our personal lives, in school and in work places. Thus mobile learning crosses the boundary of institutional learning and looks at practical fields like research and medicine, too. Also, the conference will look at the latest developments in hardware and software which can support personalised learning. By focusing on theory and practice, development and use, teaching and learning, formal and informal contexts, the ‘Mobile learning: Crossing boundaries in convergent environments’ Conference intends to offer spaces for researchers, practitioners, developers, the industry and policy makers to exchange ideas, experiences and research around issues and approaches to mobile learning, including sociological and educational issues and their effectiveness and desirability as learning spaces as well as the design of environments. Whilst the conference includes a traditional research paper strand, we also encourage proposals for sessions in different formats including workshops, posters, cafe and debate sessions, videos, slideshows, podcasts, cartoons and hands on sessions. There will be a German language strand, so contributions in German are also welcome! We will also provide opportunities for ‘unconference’ events, including the provision of spaces for informal meetings and discussions. The number of participants is limited to 150. However, video contributions for loop-presentations during the conference from people who are not able to attend in person are welcome. The ‘Mobile learning: Crossing boundaries in convergent environments’ Conference is preceded by the EduCamp, a specialised BarCamp for people interested in media and learning, which will take place in Bremen from March 19 to 20, 2011. Pontydysgu will broadcast their show “Sounds of the Bazaar LIVE Radio Programme” live via internet.